Like any parent, we make our child’s birthday is about whatever they want to do. L’s birthday was last week and it included four days of celebrations with our families in Illinois. On her actual birthday, we were at J’s parents house in Oak Lawn. We had presents, cupcakes, princesses..whatever she wanted, but when it came time for dinner, she didn’t really have a pick. I mean, she’s only three. I’m surprised her pick wasn’t McDonalds. Since she didn’t pick a place for dinner, I did. My brother had tipped me off to a BBQ place about six miles from my in-laws. 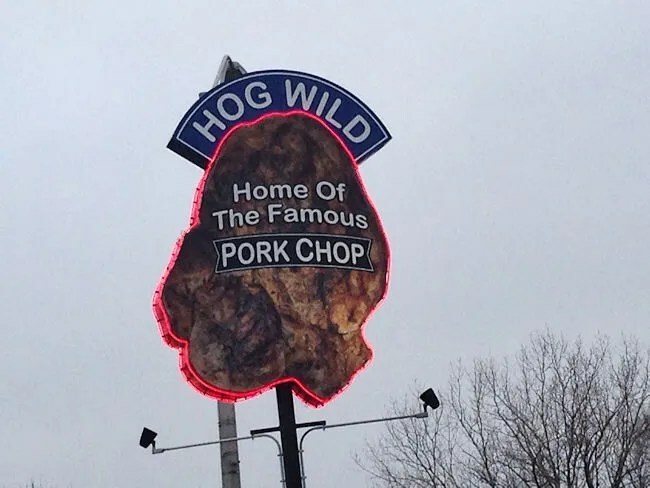 He has never been there himself, but he has told me many of his friends and co-workers make the hour drive from the Kankakee area just for some delicious BBQ. 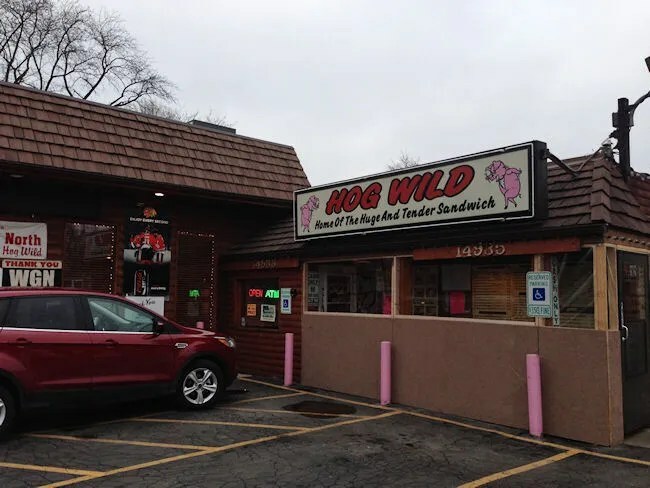 The BBQ joint is The Original Hog Wild on Pulaski Road just south of the intersection of 147th Street (or if you’re really familiar with Chicago, just south of 149th street, but 147th is the closest major intersection) in Midlothian. The restaurant looks awfully out of place in the city. It has the honky tonk feel to it. Just a little BBQ shack along a busy north-south connector a few miles outside of the city of Chicago. 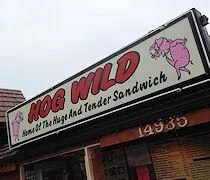 My in-laws surprisingly had never eaten at Hog Wild either. My father-in-law always heard there was no parking and there is actually a shuttle that will take you from a public lot to the restaurant, but there is actually some parking on site. It looked like a large lot to me, but just looking at the size of the dining room and waiting area, I get the feeling that lot is not enough on a busy night. The restaurant is cash only and they make sure you know that before you get to the order counter. There is an ATM by the door and several signs along the way to remind you. We called our order in, so it was waiting for me when I stepped in to the order line. It was 4:30 on a Thursday, so the restaurant wasn’t that busy yet. There is a guy standing out away from the register with an order pad taking orders, so you just have to grab the slip and take it to the cash register when it’s your turn. My order was waiting so I just stepped up and asked for it. One of the meals was a combo, so it came with a fountain drink. I grabbed that after I paid the $50 tab (with cash, of course) and headed in to the dining room to fill it up. The menu I looked at said they had Pepsi, so I was disappointed to find a Coke machine, but whatever. I still drank it. The restaurant is about a twenty minute drive from my-inlaws, so by the time I got back, everybody was ready to eat. I opened up the bags on the table and started handing out everyone’s meal. J stuck to her usual sandwich. She ordered the Pulled Pork which came on a sub bun. The sandwich was massive. J pulled probably 2/3’s of the meat off the sandwich and it was still too much for her. 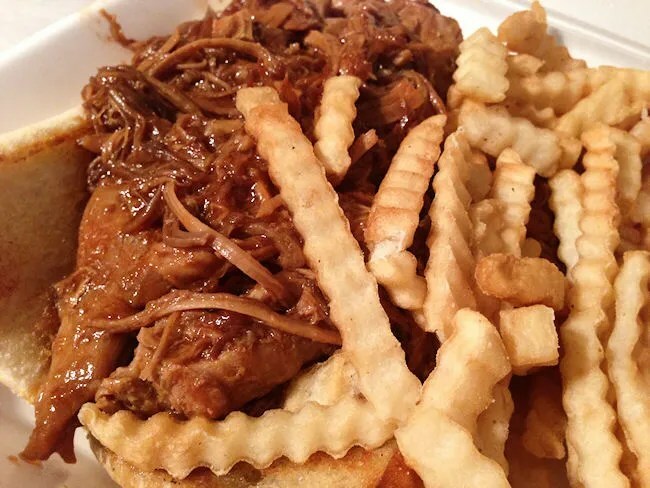 The meat isn’t pulled very thin and it’s swimming in a sweet BBQ sauce. J likes it that…I don’t, so it’s a good thing I didn’t actually order it. It was a hard sandwich to eat just because there was so much meat and it was destroying the bun. After pulling off some of the meat, she still only ate about 3/4’s of the sandwich before it was just too much for her. We put the rest of it back in the Styrofoam container for later. Her sandwich was supposed to come with fries, but she opted for something different. We actually ended up with two additional sides. J wanted the Deep Fried Green Beans and we also added on a side of Homemade Mac & Cheese. 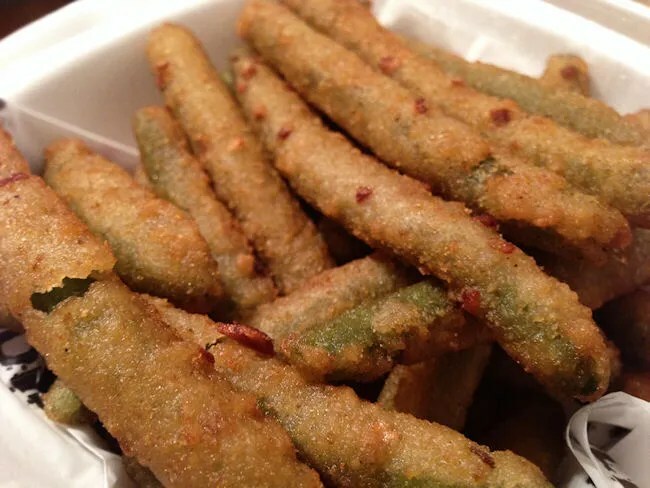 The green beans were nice and crispy both on the inside and outside. 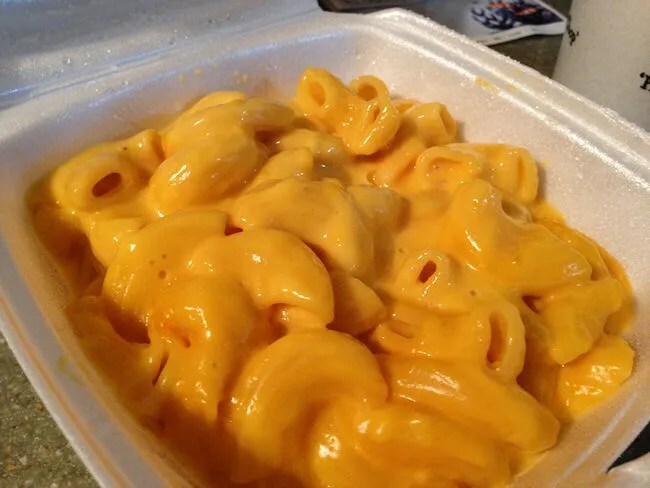 The mac & cheese was shell pasta swimming in an electric yellow sauce. It was good, but the color yellow seemed to be a little unnatural for a homemade mac & cheese. We still pretty much fought over who was going to get the small portion. J’s mom also stuck with her usual BBQ sandwich. She ordered the Smoked BBQ Beef Brisket Sandwich. Brisket is something I’m just really starting to get in to and this one looked delicious. 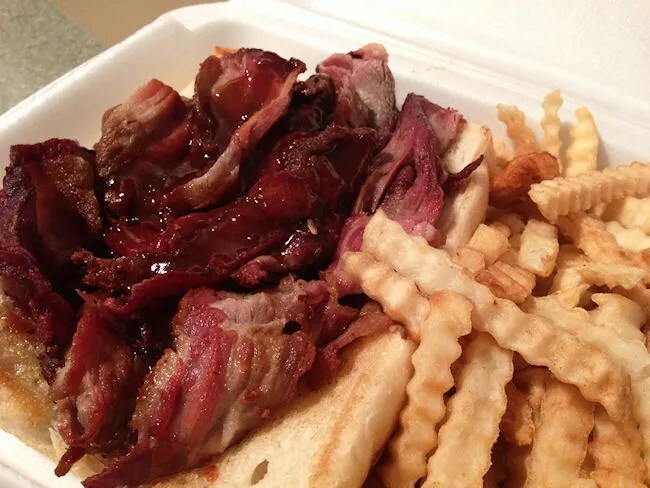 The sandwich was also served on a toasted sub bun and it had just a light drizzle of BBQ sauce over the pink, tender brisket. Since it wasn’t J’s sandwich, I didn’t ask for a bite, but Mother-in-Law said she loved it. Her sandwich came with fries and they were a disappointment. Just out of the bag crinkle cut fries that were under cooked and soggy. I’m not sure if she even ate them or if she shared the green beans with J. For the birthday girls, we ordered the Large Chicken Tenders off the kids menu. The five large tenders came with their own fries. L ate I think two and a half of the tenders and a handful of fries. She was a little distracted by all the toys she had just gotten and wanted to get back to them. I purposely left myself and my father-in-law for the end. 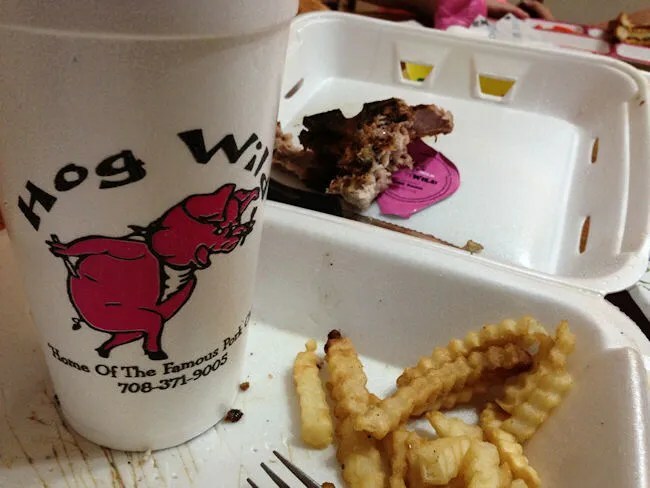 Hog Wild’s famous item isn’t any of the typical BBQ specialties. Instead, their famous item is their pork chops. Both father-in-law and I ordered the Huge and Tender Pork Chop Sandwich. The best way to describe what we got? Huge and Tender. Seriously, huge. 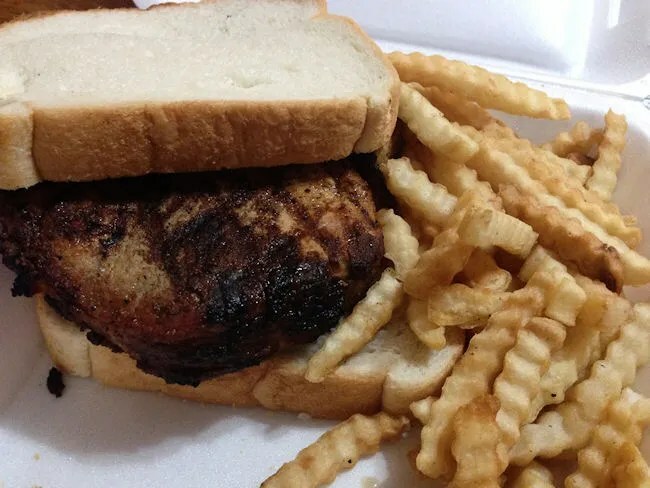 The pork chop sandwich is just served on two pieces of white bread because the bread doesn’t really matter. The pork chop is at least two inches thick and probably thicker. It has an amazing, salty crust yet it’s cooked nice and tender all the way through with just a slight bit of pink in the middle. I tried eating it like a sandwich, but the juiciness of the pork chop prevented that. The bread couldn’t hold it. Everything was just sliding around. I grabbed a knife and fork and went at it that way. The sandwich was amazingly delicious. I don’t typically stray from a pulled pork sandwich at BBQ places, but man, am I glad I did. This pork chop sandwich is amazing. Both meals came with fries and they were the same soggy fries that everyone else got…but whatever…I still ate them up.